Since I live in the Peach State and since I live in a city that boasts 71 streets with some variation of Peachtree in the name, I figured I should post a recipe with peaches. Peaches are in season in Georgia and supermarket shelves are brimming with the golden, fuzzy orbs. I anticipate the season each year and there’s nothing better than biting into a juicy peach and feeling the sweet liquor dripping down my chin and fingers. In a word…heaven! As you probably know from recent posts, I’m all about cooking and eating outside in the summer. These crostini are yet another example of a great appetizer that can be prepared outside. The sweetened cream cheese with thyme undertones provides a delectable base for the grilled peaches and Gorgonzola cheese. Take advantage of peach season and make these at your next barbecue. Enjoy! 1. Heat grill or grill pan to medium heat. 2. Mix cream cheese, sugar, and thyme. Set aside. 3. Brush peach halves and baguette slices on both sides with olive oil. 4. Place peach halves cut side down on grates or grill pan and grill for three to four minutes on each side. When the peaches are almost done, grill the bread slices for one minute on each side or until they are slightly browning. 5. Remove peaches and bread from the grill. Cut peach halves into four slices. 6. Spread cream cheese mixture on each slice of bread. Top each slice with two peach slices and Gorgonzola cheese. Drizzle each with honey. 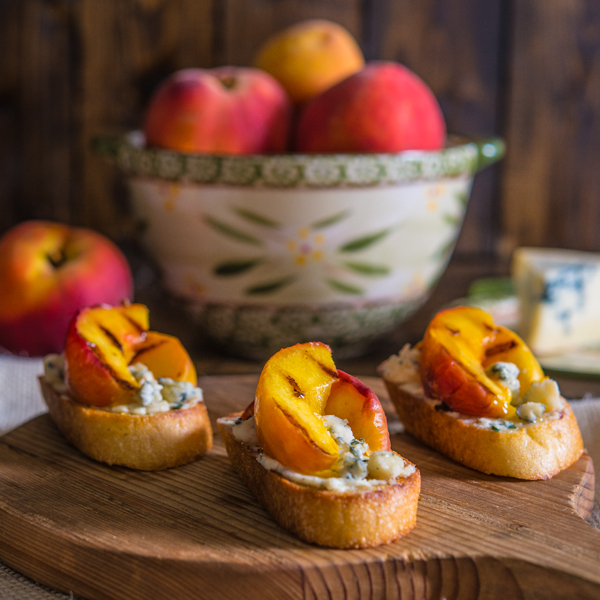 The peach and Gorgonzola crostini look amazing and I will be making it as soon as I can get my hands on some Georgia peaches! I just discovered your food blog and my mouth is watering……can’t wait to try more recipes. Tonight I am making the tomato and gruyere tart. It’s in the oven now and we can’t wait to dig in! Thank you so much, Melinda. I really appreciate you dropping by. Let me know how the recipes turn out. Terrific looking dish! We’ve had Georgia peaches in the stores for a while, and are now starting to get local peaches – one of my favorite times of the year! I’ve never made a peach crostini – fun idea. Love the idea of pairing peaches with Gorgonzola – that’s inspired. Good stuff – thanks. I want one or two or three! These look so good and what a tasty treat to enjoy while waiting for the entree to finish cooking on the grill. I bought a flat of peaches the other day and was planning on grilling some but we ended up just eating them all. 🙂 Looks like I need to go buy another flat. Thanks, MJ. I know what you mean about peaches. This year has been a great one for Georgia peaches and I just can’t stop eating them! The Georgia peaches have been great this year, but I say that almost every year because I love peaches. What a great appetizer. It definitely would not last long at my house. Grilling out is the way to go in this southern heat. Bill, these look super tasty! I love this twist using this perfect summer fruit! Thanks for dropping by, Jocelyn! Thanks, Nancy. I appreciate the visit! Wow, such a nice combo. Really like gorgonzola paired with it. Bill, this looks so colorful and gorgonzola, wow. Perfect for a summer snack. Thanks, Anne. Just checked out your peaches and panna cotta. Great post!! Oh man do these look delicious, Bill! I made something similar with peach salsa and goat cheese recently. With the honey, too. Oh god, so yummy! Thanks for dropping by Georgia! Peach salsa and goat cheese! Yum!